SUMMARY: Newsrooms interested in creating an investigative news team should choose journalists with a variety of skills, set clear goals, and establish a defined workflow process. A couple of years ago, the movie Spotlight inspired all of us to think even more about investigation as a journalism tool. The Boston Globe case brought to light the power and also the value of having a focused and armoured team available for these instances. Back then, most of us respected and cheered on the amazing job actually done within the context of the project, but Spotlight was still a movie. How to bring such a project to reality? The creation of GDI has brought investigative journalism to the forefront of the local newsroom while also surfacing a number of lessons worth noting about implementing such a team. 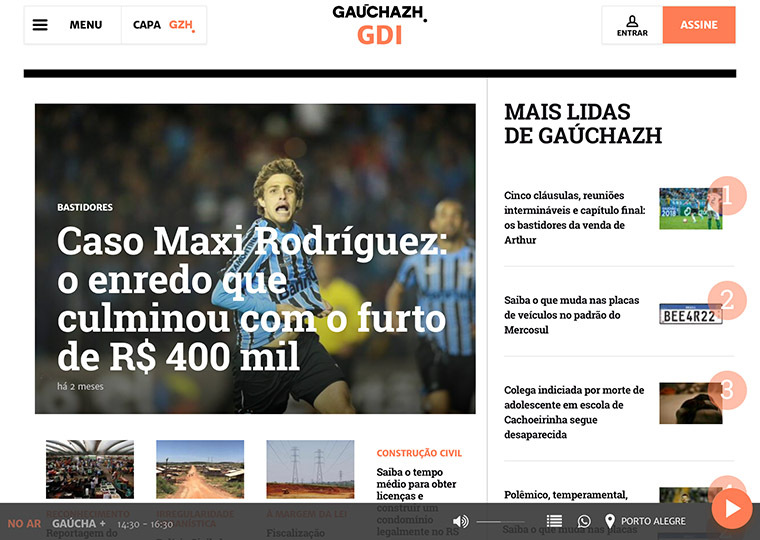 In December 2016, Grupo RBS, a media group based in southern Brazil, launched its investigation group called GDI/Grupo de Investigação. What we have learned since then is that just having a special team does not mean success, result in awards, or create a social impact. Here are some lessons we’ve learned from the formation of this investigative group that may be of value in your local newsroom. Multi-skilled team: Investing just in experienced reporters does not change the game. It’s important to choose reporters with different skills. In our group, which is made up of 10 special reporters with TV, radio, and newspaper backgrounds, we mixed skills such as abilities with data journalism and hidden cameras, for example, with those who are meticulous and resourceful. Clear goals: Of course it is nice to publish breaking news with a high social impact or debunk a story. But in setting goals, an investigative group might also seek to gather complementary competences, value a (vehicle) brand, and stimulate a collaborative culture. In our case, since group members have journalistic backgrounds from different newsrooms, the goal is key to keep our workflow on track. Systematic process: When you have a big group with widespread editorial leadership as we do, it is fundamental to have a clear list of tasks and workflows. This includes scheduled and regular meetings, a clear definition of a story’s size and scope of who is doing what, formal and regular sharing at the newsroom managerial level, and, last but not least, a face for each story as a “project” with a well-chosen and empowered owner. One vehicle produces and the others only repurpose it. One vehicle produces and the others just publish it, without complementary research. One vehicle produces and the others publish it, with a complementary research. Two or more vehicles produce it and the publication is done by all. This division helps to define the team and better manage the editorial process, publication, and distribution. Keep track: An investigative group should not be treated differently inside your newsroom. The same rules must be extended to the stories it publishes. Since we keep track of the audience, engagement, and volume of every team and article, this is also true for our GDI journalists and work. The only difference is that the levels and KPIs will never be the same. In one year, GDI published 31 stories that resulted in 29 federal and state investigations. We earned multiple awards and were showcased by universities and in news media seminars nationally and internationally. To get to the next level, we must continue evolving with all these lessons and also try to amplify our social impact even more. This year, our plan to achieve this is to keep an eye out for meaningful stories but also create a partnership with universities, launch extension courses, and get journalism students to act as co-producers for some stories, for example. Why go back to school? Because planting this seed in our future journalists might help keep investigation alive and in the “spotlight” of professional journalism.